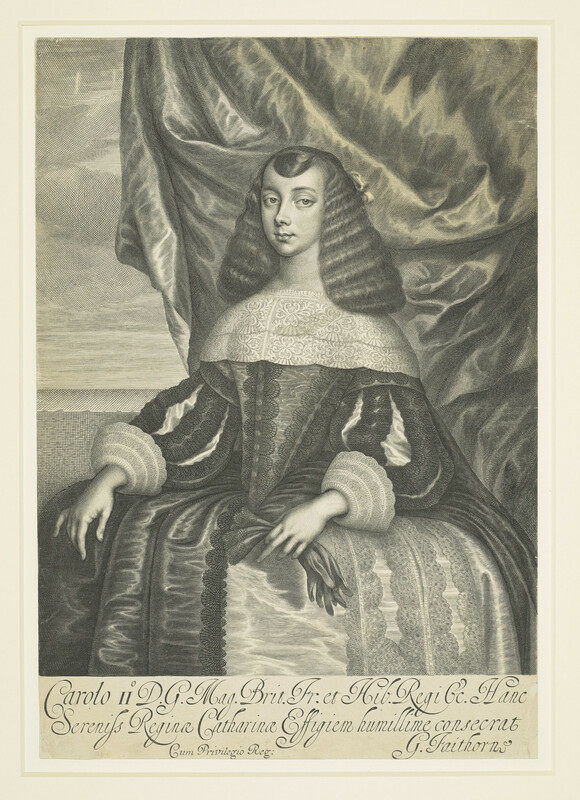 An engraving of Catherine of Braganza as queen: three-quarter length; wearing a lace collar, brocade gown and with gloves in her left hand; with a silken curtain as a backdrop; with a Latin inscription below. Rare. Borders trimmed. In 1660 the engraver William Faithorne was appointed to the 'office of Graver in copper to his Matie', securing his position as the leading printmaker in England.This engraving was based on a painted portrait by Dirck Stoop that had been sent to Charles II in London as part of the marriage negotiations. It was probably produced in the year of their marriage. Public interest in the appearance of the new queen led to high demand for printed images; the publisher, Peter Stent, stocked seven different portraits of Catherine and four double portraits with Charles II.